WINNIPEG - July sales results show a continuation of a second quarter of brisk market activity. Condominium sales really stood out in July with a 32% increase over July 2016. Total July Multiple Listing Service® (MLS®) unit sales of 1,438 went up 6% over July 2016 level and the 10-year July sales average. It is the second best July on record with only July 2014 eclipsing it by 3%. This July’s dollar volume of $416 million is the first time the month of July reached and surpassed $400 million in sales transactions. Year-to-date MLS® sales of 8,508 is now slightly ahead of last year’s record-breaking pace while dollar volume at nearly $2.5 billion is up 5% over the same period in 2016. With a new release of 2016 Statistics Canada Census data this month which provides more breakdowns on families and household make-up, the city of Winnipeg and its entire CMA (includes surrounding municipalities) have grown faster in population over the past 5 years than the national average. Moreover, the number of private dwellings occupied in the city of Winnipeg and surrounding rural municipalities has ratcheted up to accommodate increased population demand for housing. 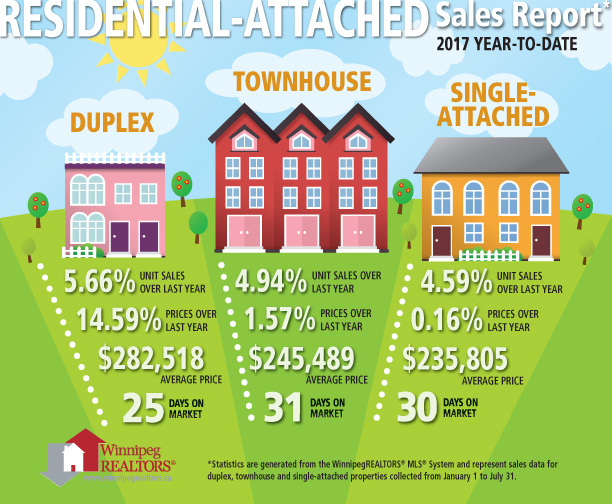 The drop in listings this year is almost entirely attributed to residential-detached listings whereas other property types such as condominiums have seen their listings in line or greater than 2016. The most active price range for residential-detached sales in July was from $250,000 to $299,999, 23% of total sales. Broken down further, both the $250,000 to $274,999 and the $275,000 to $299,999 price ranges represented 10.95% and 12.20% of market activity. The closest to these ranges in representing higher sales volume were the $225,000 to $249,999 and $300,000 to $324,999 at 8.55% and 8.26% respectively. In what is one of the best month performances ever for condominiums at 207 sales, the most active price range was from $150,000 to $199,999 at 27% of total sales. The next busiest price range was from $250,000 to $299,999 at 18% of total sales.